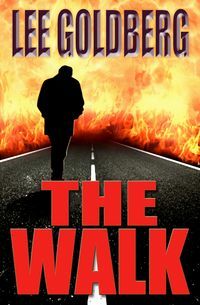 My novel THE WALK, originally published by Five Star in the early 2000s, was a critical success but a commercial failure that went quickly out of print. I republished it on the Kindle in 2009 and it has become a bestseller, selling over a hundred thousand copies. As recently as last month, it was #1 again on Amazon. Today, Amazon is featuring the book in their announcement of the new Amazon Matchbook program. Today, Amazon launched Kindle MatchBook, a new benefit that gives customers the option to buy—for $2.99, $1.99, $0.99, or free—the Kindle edition of print books they have purchased new from Amazon. Over 70,000 books are enrolled in Kindle MatchBook, with more being added every day. Now customers can visit www.amazon.com/kindlematchbook to see all of their print books that are eligible for the Kindle MatchBook edition. Customers can also see when a book is eligible for Kindle MatchBook on the book’s detail page. The program was announced on September 3 with over 10,000 titles. Since then, thousands of popular books likeHeaven is for Real, The Things They Carried and The Way of Kings have been added from major publishers such as HarperCollins, Macmillan, Houghton Mifflin Harcourt, Amazon Publishing, Wiley, Chronicle Books, and Marvel, as well as thousands of titles from Kindle Direct Publishing authors like The Walk by Lee Goldberg and Falling Into You byJasinda Wilder. When THE WALK came out in hardcover seven years ago, nobody noticed it. I figured that was the end…but 15 months ago, I re-released it as an ebook. It was an immediate success and has sold nearly 12,000 copies so far and is still going strong. 1. Send me an email at lee@leegoldberg.com with the subject FREE WALK BOOK and give me your name and the address of your website or blog (don’t have one? That’s okay. Read on). 2. Agree to post a review, positive or negative (but with no spoilers!) on your blog, website, Goodreads page, Facebook page, or the Amazon listing for THE WALK by Christmas Day. (You don't have to buy the book on Amazon to review it there, you only need to have an account). 3. Email me a copy of the review or a link to the post. This offer is limited to the first 100 people who respond by November 30. UPDATE 10-27-10, 5:14 pm: I've given away thirty books already…so if you're interested, you'd better hurry! The blogger Unfanboy’s very positive review of THE WALK is the most detailed, and thorough, one the book has received yet. Here’s a taste. The plot seems simple enough: it is the story of a man’s attempt to get home and find his wife after the long-anticipated “Big One” earthquake more or less levels Los Angeles. As the book’s peripatetic title might suggest, it is more of a philosophical meditation than a thriller – except that makes the book sound much less funny than it actually is. It might be more appropriate to describe The Walk as a kind of anti-apocalypse novel, or perhaps a satire on every disaster movie you’ve ever seen – but like the best satires, it offers some redemption in the end. it's a book far richer than most suspense novels[…]Marty Slack is the protagonist, a TV executive whose largest burden is being himself. As much as he resents and hates the grasping, greedy, treacherous people at the top of the TV ladder, he has to reluctantly admit to himself, in the course of his journey to reach home after being stranded miles away, that he is an awful lot like them. Slack is a character we get to know as well as we know people in the best of mainstream novels. Goldberg gives us a real live person here. And he doesn't cheat. We come to like Slack but there are moments when we see him as shallow, selfish and even pompous. But he's fascinating because he's so well detailed. […]And then there's Marty Slack's marriage. This storyline is another example of what I mean about Goldberg pushing against genre boundries. This isn't just a cliche portrait of a marriage in trouble. This, and at some length, is the dissection of two people who've realized that their marriage may be beyond repair. The scenes of recrimination, rage, despair hurt to witness. Beth Slack is just as painfully real as Marty Slack. […]This is a magnificent novel–by turns hilarious, scary, sad, witty and ultimately wise on its judgments about the way so many of us live these days. Thank you so much, Ed! THE WALK is part adventure novel, part horror novel, part comedy. 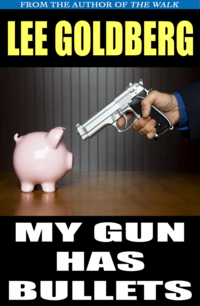 A lot of terrible, tragic things happen, but Goldberg’s dry, satiric wit crops up often enough to keep things from getting overwhelmingly gloomy. Marty and Buck are fine characters who play off each other wonderfully well, and the pacing really keeps the reader turning the pages. All of it leads up to an absolutely great ending that really put a grin on my face. […]this is hardly an unbiased review, since Lee Goldberg and I have been friends for years. However, trust me on this. THE WALK is one of the very best novels you’ll read this year or any other year. Thank you so, much James! 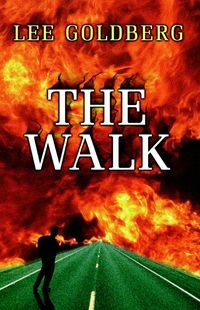 Back in 2004, I wrote a book called THE WALK, which was released in hardcover by Five Star and quickly slipped into obscurity. But a little over a year ago, I made the book available on the Kindle… and since then, it has sold nearly 9000 copies. Non-Kindle users have repeatedly asked me to release a trade paperback edition. I am pleased to announce that a paperback edition is now available on Amazon and CreateSpace for $11.99. It's one minute after the Big One. Marty Slack, a TV network executive, crawls out from under his Mercedes, parked outside what once was a downtown Los Angeles warehouse, the location for a new TV show. Downtown LA is in ruins. The sky is thick with black smoke. His cell phone is dead. The freeways are rubble. The airport is demolished. Buildings lay across streets like fallen trees. It will be days before help can arrive. Marty has been expecting this day all his life. He's prepared. In his car are a pair of sturdy walking shoes and a backpack of food, water, and supplies. He knows there is only one thing he can do … that he must do: get home to his wife Beth, go back to their gated community on the far edge of the San Fernando Valley. All he has to do is walk. But he will quickly learn that it's not that easy. His dangerous, unpredictable journey home will take him through the different worlds of what was once Los Angeles. Wildfires rage out of control. Flood waters burst through collapsed dams. Natural gas explosions consume neighborhoods. Sinkholes swallow entire buildings. After-shocks rip apart the ground. Looters rampage through the streets. There's no power. No running water. No order. Marty Slack thinks he's prepared. He's wrong. Nothing can prepare him for this ordeal, a quest for his family and for his soul, a journey that will test the limits of his endurance and his humanity, a trek from the man he was to the man he can be … if he can survive The Walk. 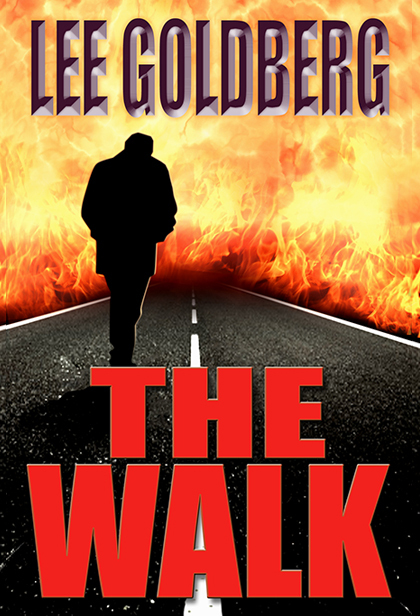 If you are a book critic/blogger, and would like a free review copy of THE WALK… as a PDF, an ebook, or as a trade paperback… please send your name, the address of your blog/website, and your preferred format to lee@leegoldberg.com. THE WALK is, by far, my best-selling book on the Kindle. It out-sells the e-editions of all of my MONK novels and the e-editions of all of my previously out-of-print stuff. Every month I sell more copies than the month before. And today, a little over 12 months since I put the book on the Kindle, I reached a milestone: I sold my 7000th e-edition of THE WALK. So today I am changing the cover. And here's the new one, designed by Carl Graves. I think Carl did an amazing job…and I predict my sales, which have gone up every month, will shoot up even more with this cover. What do you think? Am I sabotaging myself…or is this a smart move? This was another record month for my Kindle sales. Sales were up across the board — in March, I sold 1360 books, in April I sold 1798, and this month I sold 1919. I earned $1415 in April and this month I earned $1543. THE WALK continues to be my bestselling title. I sold 629 copies in April and 720 this month. THE MAN WITH THE IRON-ON BADGE is a distant second, with 234 copies sold, exactly the same number as last month. How bizarre is that? GUILTY, one of my re-branded VIGILANTE novels, moved up to #3 with 184 copies sold compared to 125 last month. There was one bit of troubling news…MY GUN HAS BULLETS went from selling 264 copies last month to 166 this month… I have no idea why sales plunged by 100 copies. That's a dramatic drop. I may need to try a new cover and see if that will stop the slide. This will be the last month of Kindle sales under the old royalty system. Starting July 1, my royalties will go from 35% to 70% of each sale. I can't wait.